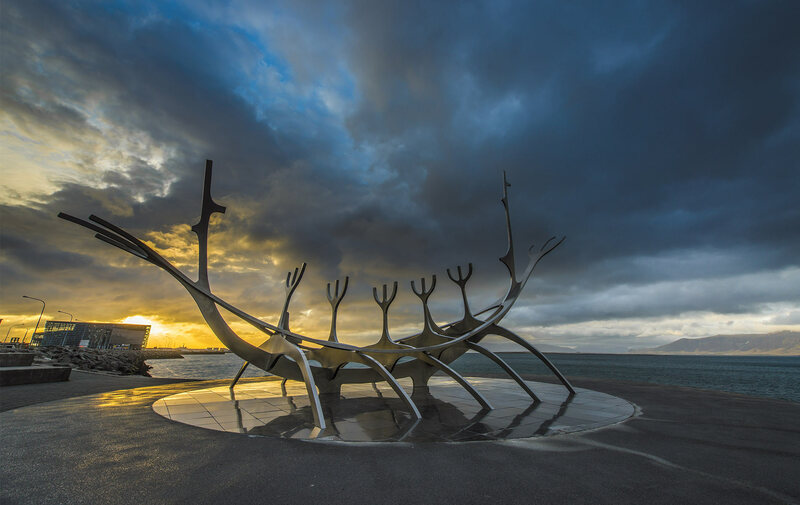 Sólfar (The Sun Voyager), is a sculpture by Jón Gunnar Árnason, is located by the sea near Reykjavik's city center. The sculpture is an ode to the sun. As the South got an early taste of winter and daylight savings came to an end, I felt it was an appropriate time to write about my recent trip to Iceland. Tennessee, Georgia, and even Florida were subjected to brisk winds, dropping temperatures, and of course, fewer hours of sunlight during the first days of November. The stereotypical vision of Iceland is just that—a stereotype—only it applies all year long. During the summer, light fills the Icelandic sky—sometimes for twenty-one hours a day—the temperatures warm up, the brisk winds die down, and the interminable rains come. Most important, Icelanders flock to enjoy the country’s natural hot springs, mountains, and glaciers and to participate in anything outdoors, where they can be surrounded by wonderful fresh air, which is fueled by the island’s North Atlantic oceanic climate and steady winds. Once outdoors, most of the people who reside in this country close to the Arctic Circle stay outdoors for as much time as possible. According to one Icelandic guide, “Icelanders have long enjoyed one of the highest life expectancies in the world.” The explanation for this phenomenon seems to be a clean environment, a healthy diet, and exceptionally good drinking water (due to the freshwater rivers that stream down from the mountains and glaciers). There are numerous rock sculptures, lava formations from prior volcanoes, and mountains and waterfalls of all sizes. In the last several years, since the Great Recession ended, Iceland has been slowly building its tourism market. And this market is no longer geared just to younger outdoor enthusiasts who partake in all of the extreme sports offered by the country. 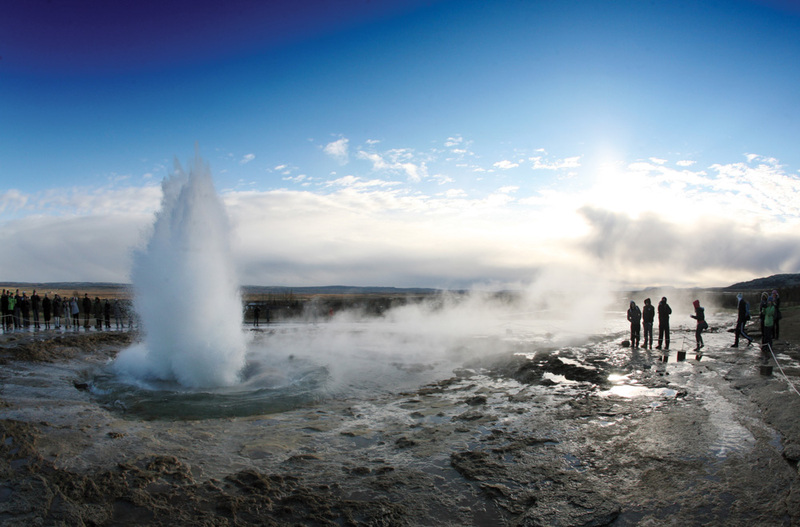 Yes, geothermal spas, such as the famous Blue Lagoon, and volcano and glacier viewing and hiking still draw visitors from the United States and Europe. But now the incentives to visit this island, which has a total population of just over 327,000, have expanded. Busloads of tourists come from all corners of the globe, touring the countryside to view waterfalls, volcanoes, and museums. Still others come during the fall months to view the Northern Lights and in the winter for indoor venues and happenings. The tourist board is focusing on special-needs travel, the viewing of exotic tundra, and places to visit where English is widely spoken. And no visa is needed to visit Iceland, which lies just three hours of airtime from Europe and five hours from the United States. “Meet in the Middle!” is the slogan for a Reykjavik Convention Bureau campaign promoting conventions and events. Reykjavik is the capital and largest city of Iceland and a popular tourist destination. With a population of around 120,000, it is the heart of Iceland’s cultural, economic, and governmental activity. 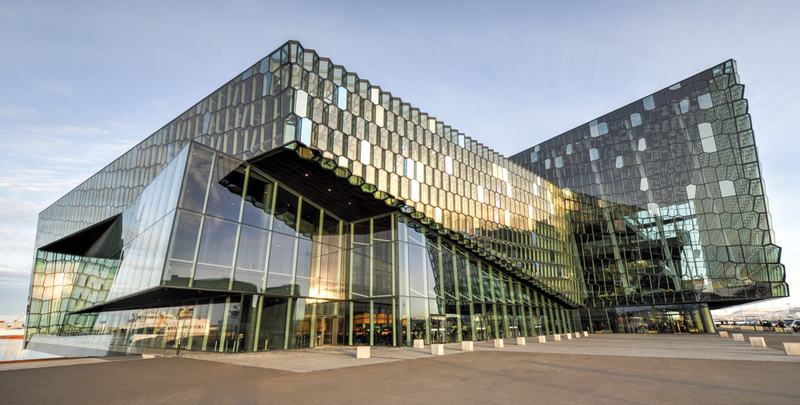 “In Reykjavik, Iceland’s capital, the Harpa Concert Hall and Conference Centre has added to the country’s ability to host large events of different kinds, including orchestral concerts and conventions,” said Helga Lara Gudmundsdottir, the manager of conferences and meetings for Iceland Travel. When singer/entertainer Justin Timberlake brought his sold-out show to Reykjavik this past August, it was not held at Harpa but at another venue instead. The concert’s live stream provided a look for people in Iceland who couldn’t get tickets, as well as for us here in the U.S. Everywhere we looked this past year, Iceland’s name was popping up. Hafthor Julius “Thor” Bjornsson, winner of the World’s Strongest Man competition, is possibly more quickly recognized as Gregor “The Mountain” Clegane in HBO’s television series Game of Thrones, parts of which are filmed in Iceland; the New York Times Magazine featured a full-page color picture of a three-and-half-year-old at breakfast in Reykjavik in an article focused on what children all over the world eat for their first meal of the day; and this past August, the Icelandic musical Revolution in the Elbow of Ragnar Agnarsson Furniture Painter established a good run at one of New York’s larger off-Broadway theatres. Harpa Concert Hall and Conference Centre—the first purpose-built concert hall in Reykjavik. Harpa was opened in 2011. But, the mention of Iceland that really caught my attention was still another article in the New York Times with the following heading: “Rare Arctic Land for Sale.” It seems that the Chinese have taken a great interest in Iceland. One of their country’s tycoons, Huang Nubo, wanted to purchase a vast wilderness tract to obtain a foothold in “the North.” Additionally, Americans from the Northeast and northern Europeans are shopping for pieds-à-terre in Reykjavik for their own vacations, as well as to use for income-producing rentals. What are those “other things” attracting the million-plus visitors per year to the country? The fact that you can experience both fire and ice in Iceland makes it a country of vast contrasts. There are numerous rock sculptures, lava formations from prior volcanoes, and mountains and waterfalls of all sizes. In the west are high tabletop mountains with narrow fjords in between, but in the east, the mountains by the fjords are more harsh and rugged. Strokkur, one of Iceland’s most famous geysers, erupts about every five minutes, shooting water to a height of fifty feet, and sometimes up to 120 feet. Iceland is situated on top of two tectonic plates, making it one of the hot spots on earth because of intense volcanic activity. Just a few weeks before we arrived, Bardarbunga threatened to erupt but, luckily for us, she decided to wait until after we left to spew lava down her slopes. Needless to say, Iceland is a paradise when it comes to seeing all of those varied formations in such a relatively small country. Iceland is situated on top of two tectonic plates, making it one of the hot spots on earth because of intense volcanic activity. 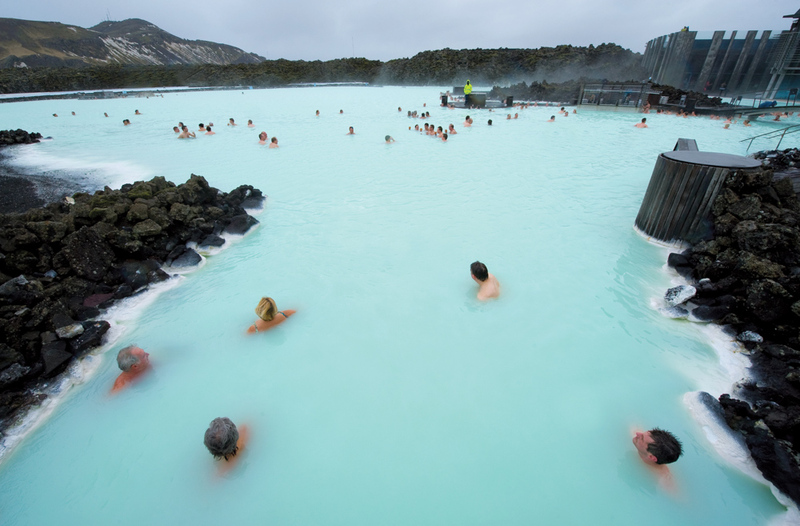 Swimming in a geothermal spa such as the Blue Lagoon is another highlight for most visitors. The lagoon and the Myvatn Nature Baths, with their high levels of silicates and other minerals, have a rejuvenating effect on the skin. You can also take a dip in the North Atlantic at a geothermal beach near Oskjuhlio. And, you can even enjoy the Northern Lights (if you are lucky enough to catch them) from Reykjavik’s Sundhollin indoor swimming pool and outdoor hot tubs. Stargazing has never been better! Seeing up close and personal the geothermal energy that Iceland produces to heat more than 90 percent of the country’s buildings and most of its swimming pools is amazing. You can easily view these renewable and highly visible energy sources as you drive along the roads outside of the capital. People bathing in the Blue Lagoon, a geothermal bath resort in southwestern Iceland—a “must” for tourists. All of the outdoor activities and viewing make you hungry, and the local restaurants and hotels feature an Icelandic diet based on farmed, bred, and caught seafood produced in superquality fashion. The fish, lamb, steak, and veal are delicious, but they are not inexpensive. Skyr, a low-fat, high-protein dairy product similar to yogurt, is a uniquely Icelandic specialty. Most Icelanders eat some Skyr every day. Fish stew is a popular menu item in restaurants and homes. The agricultural farming is done in the south coastal area, which doesn’t get much snow. In fact, shopkeepers in downtown Reykjavik said that they only got three to four days of snow last year—possibly due to global warming! Check out Reykjavik’s Fishpacking District where designer Steinunn Sigurd is now the owner and creative director of her own fashion line. 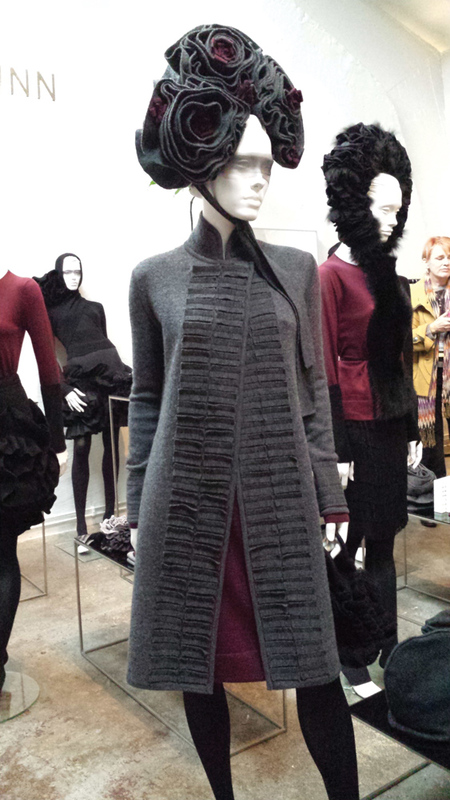 Speaking of shopkeepers, Icelandic fashion has come a long way. Check out Reykjavik’s Fishpacking District (somewhat akin to New York City’s Meatpacking District), where designer Steinunn Sigurd, who studied in New York City, is now the owner and creative director of her own fashion line and Laufey Jonsdottir is a fashion designer and illustrator. Sari Peltonen is the communications manager of the Iceland Design Centre, and she looks and dresses like a model. This area is a burgeoning mecca for fashionistas. The clothing produced in Iceland is no longer just the traditional Icelandic wool sweaters and the outdoor clothing known for its durability. Even the men’s attire is so stylish that it looks like it would be at home on the most fashionable streets in London and throughout Europe. The JOR label by fashion designer Gudmundur Jorundsson and the company’s cofounder, Gunnar Orn Petersen, presents a very mod approach to menswear. 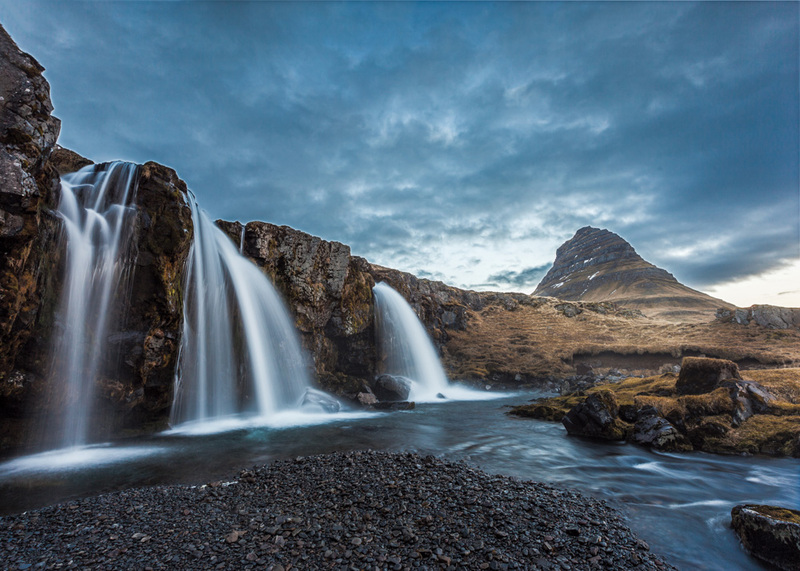 The best way to visit Iceland is by Icelandair, which is well run, on time, and comfortable and offers well-priced flights from several U.S. destinations, including Orlando. The best way to visit Iceland is by Icelandair, which is well run, on time, and comfortable and offers well-priced flights from several U.S. destinations, including Orlando. Icelandair flies into Keflavik International Airport, which is about an hour and fifteen minutes from Reykjavik. You can also get a great package for a stopover on your way to Europe. However, more tourists to Iceland are arriving by cruise ship. Many major cruise lines now sail to Reykjavik and other destinations of this island country. Hotel capacity is growing within the country, but most of the ones appealing to Americans can be found in and around the capital. The Hilton Reykjavik Nordica, where we stayed, is modern and very comfortable (complete with a fabulous health club and spa) and has an elegant restaurant. Rates for hotels, cabs, dining, and excursions are expensive. It is much better to purchase a package. 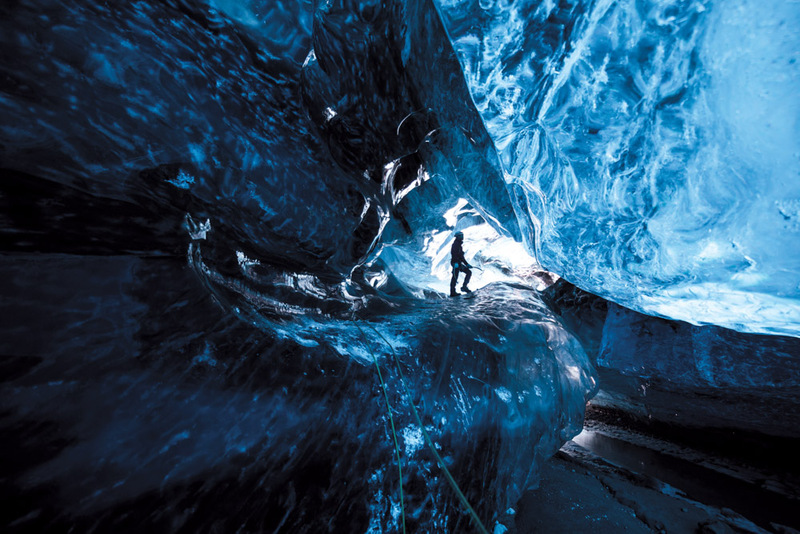 A climber is silhouetted against the inside of an ice cave in Vatnajokull. The ice is thousands of years old, is crystal clear, and so packed it is harder than steel. With its bars, cafés, and pubs, Downtown Reykjavik is known for its busy weekend nightlife and club scene. You can walk up and down the streets of Iceland, even very late at night, deciding which restaurant, club, or café you want to visit without fear. 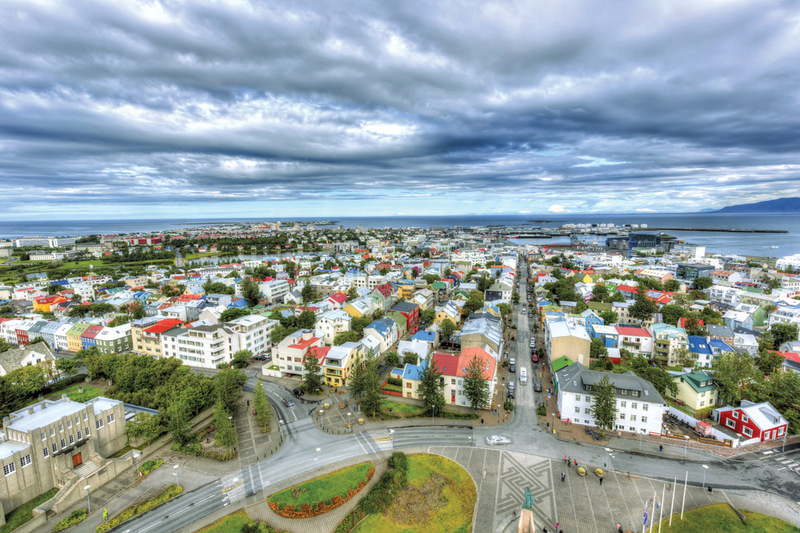 No major city can rival the safety of Reykjavik, which averages less than two murders per year in a city of more than two hundred thousand people. So, Southerners can easily visit Iceland without fear of being greeted with freezing weather and an unsophisticated environment.